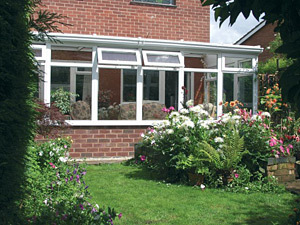 The Lean to DIY Conservatory is the most popular due to its versatility and affordability. By far the most popular DIY conservatory style. The pitch of the roof can be as low as 2.5 degrees, which is useful when having to over come obstructions like plumbing pipes or corbelled brick work. The standard roof pitch is 5 degrees which will give a top of wall plate height of 2.5m when using a 3m projection. The standard self build conservatory is supplied with 'firring', the PVCu material to close the triangular gap between the frames and the roof. The pitch can increase to a maximum of 30 degrees, creating a feel of volume within the conservatory. It will be necessary to install shaped, glazed frames above the frames on the side walls which creates an attractive feature. The lean-to DIY conservatory kit is possible the most versatile design as there is no limit to the width of the structure and the various pitches that can be applied to the roof. The maximum projection for a lean-to roof is 4.1m before structural upgrades need to be applied to the roof rafters. A modern concept is to have full height parapet walls on the sides, a 15-20 degree pitch in the glass roof and full height glass, or bi-fold doors to the front. Keep in mind the kit arrives with each frame individually packaged as these are pre-glazed in the factory and join together using the 'Kwik Konnect' system which saves a huge amount of time and will achieve a professional finish without qualified tradesmen.